A sunny Good Morning to you! Since today is actually St. Patrick's Day so I couldn't resist a little bit of green! I picked up my first Shamrock plant. I set it in an over sized glass votive and surrounded it with some faux grass. I started the slow cooker at 6:30 this morning with corned beef, red potatoes, carrots and onion plus beer and water. The cabbage is put in much later. It's a new recipe for me so I'm hoping for the best- the house smells yummy already! Just a simple breakfast with some hearty Irish Oatmeal and English muffins with jam. I love these plates for soup and sandwiches too! A good brisk cup of coffee and a cold glass of milk will round this all off! Mr. Teddy is fully content to relax in the sun while I prepare things. I love this stemware- as you can see their coloring goes perfectly with Granny Smith apples...I guess I should call them my Granny Smith swirl beverage glasses! Who knew when I collected these dishes from the different sources that they'd all be put together someday! I've kept my center arrangement from the post I created yesterday with a little modification. Just loving that little rabbit plate. I'm ready to start some Easter decorating now. Thank you for visiting and joining me for this St. Patrick's Morning Breakfast. This is a good link to about an hour's worth of Irish music from YouTube. Oh, dear friend, you are a true Lassie after my Irish heart!!! My favorite tablescaping color combination is black, white and green!!! Those green stems are stunning, indeed!!! Liz your table looks so pretty! That last shot with the sun steaming in is beautiful! Happy St. Patrick's Day to you! Liz, what a gorgeous table! Your photos are exqusite! Love your shamrock plant! What a lovely breakfast table setting with the green shamrock plant and all. The dishes are beautiful! Hi Liz, what a lovely table set for St. Patrick's Day breakfast. The sun was shining perfectly. Your shamrock plant is gorgeous. I planted it here in the garden one year and it lasted for years doubling in size till this season and our winter. I am anxious to see if it comes back again. Thank you for sharing the Celtic music too. Liz, I don't blame kitty one bit. I love that sunshine streaming in as well. Your assortment of dishes are just perfect! A pretty green shamrock plant is perfect for celebrating the day of green. My hubby was out of town so I went to my daughters and celebrated. She cooks her corned beef in the crockpot also. Everything was delicious. I'm sure yours was as well! Hi Liz! What a sweet table setting! This is the first time I'm seeing these little shamrock plants! They are so delicate looking. Now will this plant last? I hope so! Your little kitty is so cute getting her sun tan started early! :) Thanks for popping in to see me. What a beautiful table setting! I've been seeing a lot of people prepare special meals for St. Patrick's Day and made me wish that I had given it a try yesterday. I have some Irish in me, so I SHOULD one day! LOL! I hope it was good and that you had a nice holiday. 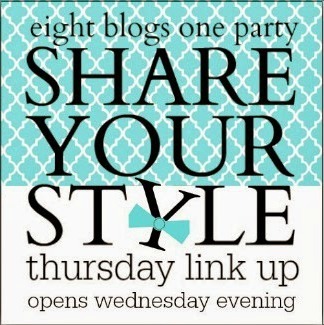 Thanks for joining Share Your Style tonight! MR. Teddy is so adorable! Love your table decoration, the combination between black, green and white is gorgeous. What a fun St. Patrick's Day table. I am in love with your oblong plates. They are such a fun idea. I guess you could buy oblong platters too. Sounds like the house smelled wonderful! My favorite part is the cabbage. We should make it more often around here. Beautiful Liz!! I always love those little shamrock plants you see at the grocery store...so super cute! Hope your Irish Dinner was a hit! What lovely photos with the soft light! The lovely green glass gobles add the perfect accent. The pretty wooden tray is great to contain the centerpiece. Have a wonderful week! Lovely, lovely table. Love your plates. It all looks so wonderful together. Have a wonderful week. Gorgeous, gorgeous!! I adore the long plates you have used. How handy they must be for soup and a bread roll. Even a simple meal like that would look beautiful on those plates. I love the sunshine peeking through your window too. Lovely tablescape Liz. I think everyone loves your long plates. where did you find them? Love the green clover centerpiece and of course seeing Teddy is an added addition. What a cute tablescape. I love the little bunny plate peeking out and those rectangle plates are gorgeous. Have a wonderful weekend! I do believe we make our corned beef much the same way. The only problem: I forgot to put mine on early enough for it to cook and it wasn't done in time for St. Paddy's dinner. Talk about having to punt! What a charming bit of Irish bliss! I love the rectangular dishes. A truly lovely vignette. Thank you for the lovely inspiration. Have a wonderful weekend. Lovely table. I love the splash of green in your stemware and that bunny plate is just too cute!